What’s Between You and the Operating Theatre? The Transport Accident Commission in Victoria Australia has launched a television advertising campaign warning about the need to wear protective clothing when riding motorbikes and scooters. 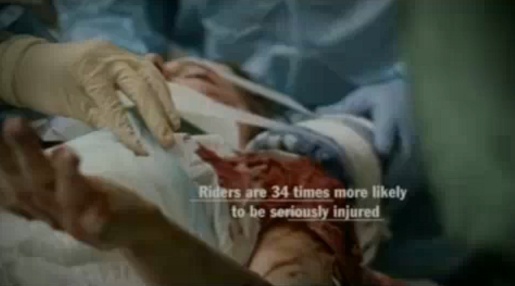 Two TV ads show accident victims being admitted to the emergency department at Austin Hospital, Heidelberg, Melbourne. Emma Goodall, nurse at Austin Hospital, talks us through the horrific injuries suffered by a young woman who came off her scooter on the way to work. Her clothing (only a work shirt) is now embedded in her skin. The woman is now facing months of skin grafts. If you ride a scooter you’ve got to wear protective clothing. Dr Fergus Kerr explains the emergency treatment being given to a young man who came off his motorcycle on the bitumen. If the man had been wearing leathers rather than just jeans he could have walked away from the accident. The TAC’s Senior Manager of Road Safety, David Healy, said the television advertisements are timely considering that in 2007, motorcycle registrations grew by more than eight percent. “Motorcycles are a part of city living and with the rise in popularity of motorbikes and scooters, the TAC aims to help riders to make safe choices on our roads,” he said. Director of Emergency at the Austin Hospital, Dr Fergus Kerr, said he’s seen too many disfiguring injuries in his twenty plus years working in emergency departments. “When riders come off bikes at high speed without protection, it’s their bodies that bear the brunt of the impact,” he said. Riders should always wear a full face helmet, full leather suit, back protector, boots and gloves. For more information on protective clothing go to www.spokes.com.au. See the campaign online where you can download the two TV ads in mpg video format. The Operating Theatre campaign was developed at Grey Melbourne.